How And Where To Buy Proair Online? You can buy Proair online through our Canadian International Pharmacy at huge savings. We offer RX and OTC medications online with a valid prescription from your doctor. At Canadian Pharmacy World, your health is our priority. You can place the order online, by mail, by fax or toll-free over the telephone at 1866-485-7979. Canadian Pharmacy coupon book is here, and we’ve got a list of all the savings in one place! The online pharmacy deals are valid from August to Dec 2018. Our Online Canadian Pharmacy also carries other asthma medications. Are There Alternative Names For The Brand And Generic Proair? What Dosages And Forms Is Proair Available In? The generic equivalent of Proair (Salbutamol Inhaler) is available in the form of 100 mcg/200 dose. What Is Proair Used For? ProAir consists of salbutamol (also known as albuterol) as an active ingredient. Salbutamol is a bronchodilator. It works by relaxing the bronchial smooth muscles and opening the breathing passages and relaxing muscles. 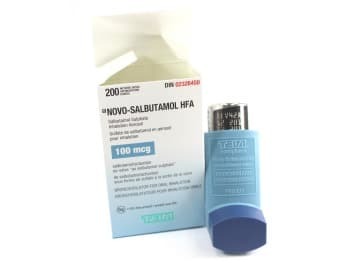 When used, a Salbutamol inhaler can help alleviate such symptoms as shortness of breath, trouble breathing, wheezing, cough, and chest tightness as well as several other reactions associated with the onset of asthma. What Are The Possible Side Effects Of Proair? Most common side effects of treatment with ProAir include chest pain, shakiness, nervousness, dizziness, headache, sore throat, faster heart rate and runny nose. It can also lead to worsening of troubled breathing, wheezing and coughing. Call your doctor immediately in case this happens and seek medical help. Other side effects include heart problems such as faster heart rate, high blood pressure, allergic reactions such as itchy skin, swelling, rash and worsened troubled breathing, low potassium levels in blood, increased blood sugar. Inhalation of salbutamol sulfate can cause paradoxical bronchospasm (worsening of breathing or wheezing), which can be life threatening. If this condition occurs, ProAir should be discontinued immediately and alternative therapy started. Call your doctor immediately in case of any unexpected event. Are there any Precautions and Drug interactions for Proair? Do not increase the dose of ProAir or take extra doses without talking to your doctor first. You should avoid spraying the medication in your eyes. Since contents of the medication are under pressure, do not puncture. Do not expose to temperatures above 120 °F as it may lead to bursting. Do not take Proair if you are allergic or hypersensitive to salbutamol or any other ProAir ingredients. If you see a different doctor, inform him or her that you are using Proair. •	Monoamine oxidase inhibitors (MAOIs) and tricyclic antidepressants. ProAir should be given with extreme caution in patients receiving these medicines because the action of salbutamol on cardiovascular system might be aggravated. This medication should be stored at a temperature of 15°C to 25°C. The contents of the inhaler are under pressure, hence do not puncture. Protect from freezing temperature and prolonged exposure to sunlight. Store the canister at room temperature before use to get best results. Keep out of reach of children.